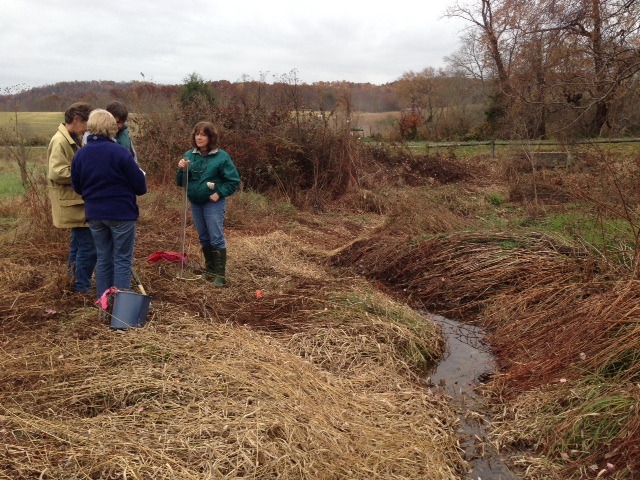 Virginia Master Naturalists conducting stream water quality monitoring. In any endeavor, there can be a tradeoff between intimacy and impact. The same is true for science in general and citizen science in particular. Large projects with thousands of collaborators can have incredible impact and robust, global implications. On the other hand, locally based projects can foster close-knit ties that encourage collaboration and learning, but face an uphill battle when it comes to creating rigorous and broadly relevant investigations. Online collaboration has the potential to harness the strengths of both of these strategies if a space can be created that allows for the easy sharing of complex ideas and conservation strategies. 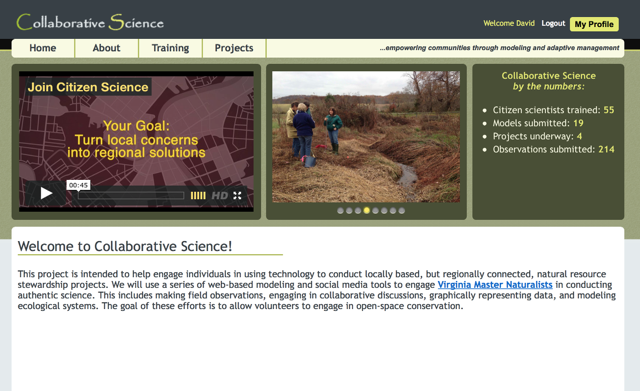 CollaborativeScience.org was created by researchers from five different universities to train Master Naturalists in ecology, scientific modeling and adaptive management, and then give these capable volunteers a space to put their training to work and create conservation plans in collaboration with researchers and land managers. We are focusing on scientific modeling throughout this process because environmental managers and ecologists have been trained to intuitively create explanations based on a very large number of related observations. As new data are collected, these explanations are revised and are put to use in generating new, testable hypotheses. The modeling tools that we are providing to our volunteers allow them to formalize this scientific reasoning by adding information, sources and connections, then making predictions based on possible changes to the system. We integrate their projects into the well-established citizen science tools at CitSci.org and guide them through the creation of an adaptive management plan, a proven conservation project framework. Screen shot of the website homepage. Our initial target audience is the Virginia Master Naturalists, a volunteer organization consisting of approximately 3,000 volunteers in 29 chapters across the Old Dominion state. Master Naturalists are tasked with environmental stewardship, citizen science and environmental education in partnership with the Virginia state government. Our volunteers undertake 40 hours of initial training and are required to participate in volunteer work and advanced training every year. So far, we have run pilot projects and are using the results of these to scale up across the state this year. We are currently measuring the impacts of cattle on water quality and testing a variety of control measures on an invasive grass in a rare, fire-dependent pine savannah habitat, home to an endangered species of woodpecker. We hope to open up the tool to similar organizations nationwide within two years. Please learn more about what we are doing by watching the videos on our home page at CollaborativeScience.org. More information about the modeling tool can be found at MentalModeler.com and the project creation tools at CitSci.org. About the Author: David Mellor is the Citizen Science Coordinator with Virginia Master Naturalists Program at Virginia Tech University. He is a behavioral ecologist who studies the effect of citizen science projects on the environment and on the people conducting the science.